Housing investors led a strong jump in mortgage lending in November, adding credence to other signs of a bounce in the Australian housing market. Overall, the value of lending rose 2.2 per cent for the month to $33.2 billion. Investor loans made up around 40 per cent of that total, at $13.27 billion, up a very strong 4.9 per cent. 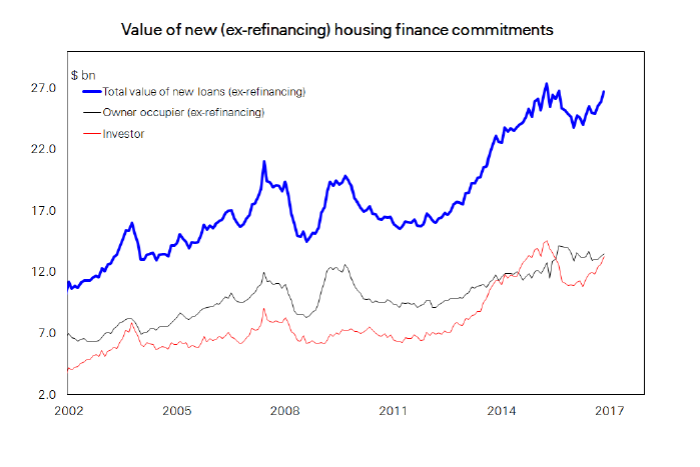 However, when refinancing is excluded, property investors now again account for around half the loans being issued, and are trending up. Deutsche Bank economist Phil Odonaghoe said the housing market resurgence is likely to be unwelcome for policymakers. "Further evidence here of the resurgence in housing market activity apparent through 2016, and we suspect that the RBA will not be entirely comfortable with the strength in investor activity in particular," he wrote in a note. "It remains to be seen whether this resurgence extends into 2017." CommSec's senior economist Savanth Sebastian said the housing market looks set to continue being a significant concern well into 2017. "Couple it with the lift in home prices in the latter part of last year and it suggests that the housing landscape may continue to cause policymakers a little bit of angst over 2017," he wrote in a note. "The value of loans by investors surged by 4.9 per cent in November to be up 21.4 over the year – the strongest annual growth in 19 months." Of further possible concern to the Reserve Bank are the data for construction and purchase of new dwellings, up 2.3 and 3.3 per cent respectively, at a time when the RBA and other expert analysts have been warning of a looming apartment oversupply. Mr Sebastian said the housing market resurgence may prompt further regulatory intervention. "If home prices continue to lift, with growth largely driven by investor loans, regulators may look at further restrictions to curb lending," he added.